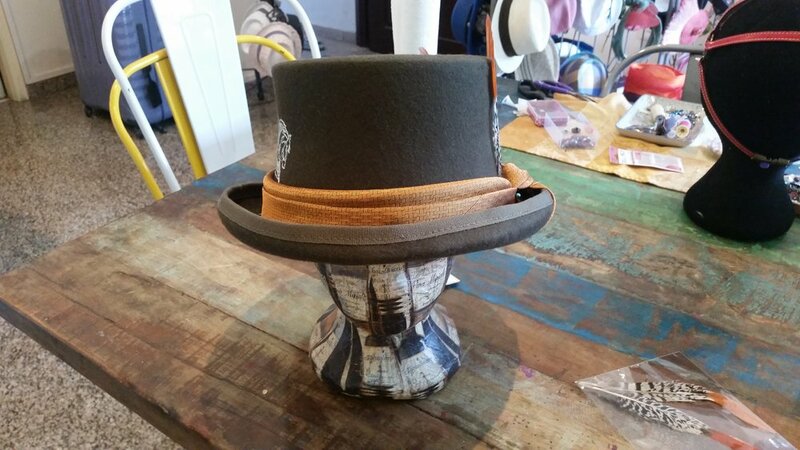 The Top Hat is a classical design of men hat during Derby like you can see during Royal Ascot last week. We keep in mind the theme "Emirates derby", right?? ok, after the shape let's choose the color. This one is hand made with dark green felt - size 59. I would like to represent the Speed - common for the plane and the horses. That's why you can find an hand made embroidery of a Pegasus. Then I used a fancy Hermes tie as a silk ribbon with a funny jumper sticking out his tongue - to balance the strict shape of the top hat. On the left side, you can find 3 pheasant feathers that also remind traditional hunting parties. I hope you will love it!! !